🎹 UPDATED REVIEW - January 11, 2019 - Roland DP603 Digital Piano - Recommended - Roland is known for producing some great musical instruments including digital pianos, synthesizers, guitar products, percussion, recording & audio equipment, and the list goes on. Many pro players as well as institutions own Roland digital pianos and Roland produces some good ones. 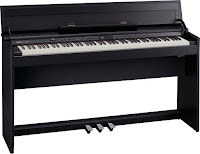 The Roland DP603 digital piano ($2399US internet price) in satin black finish only - no bench) or the DP603 in polished ebony or white finish including matching duet bench ($3199US internet price) are competitively priced and do offer a satisfying piano playing experience for many people with Roland's new piano sound technology and responsive key action. Roland has had the compact cabinet DP line of pianos for many years and they have been very good pianos and this is no exception. 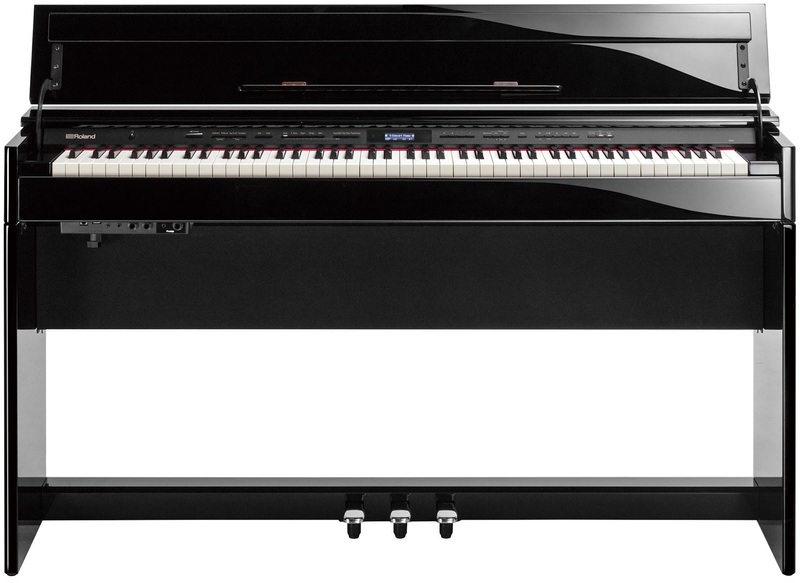 So what makes this new DP603 piano a good choice? 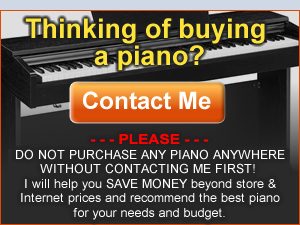 There are many things that I can point out that should give a piano shopper good reasons to buy this piano. But before I go on further, I want to point out that Roland has had a new line of home style digital pianos out for awhile (nearly 2 years) with the exact same digital technology, functions, key action, and pedaling as is in the newer DP603. In fact the DP603 is really just a less expensive version of the Roland HP603 home cabinet digital piano which is only found in local US Roland piano dealers and not for sale on-line in the US. 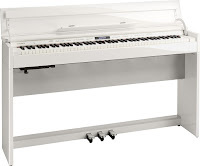 The HP603 sells for closer to $3000 in the Roland piano dealer stores but they come in a more traditional piano cabinet with a nice duet bench longer warranty, and the home pianos include an accessory package at no charge. Otherwise the the new DP603 is virtually the same instrument as the HP603 model, with the exception of cabinet design & structure and one added Bluetooth feature. What is the difference between this new Roland model over the previous Roland models as well as compared to their competition from Yamaha and Kawai? To start off, for the first time Roland has created a hybrid key action unlike anything they have done before. Each key consists of a combination of wood and plastic (instead of all plastic in the previous Roland models) and Roland claims this gives the key movement more authenticity and natural weight as well as eliminates maintenance of the all-wood key actions. Roland's claim is that these new keys give the key structure more durability and more rigidity (with the addition of an inner stabilizer pin which also reduces lateral key movement) while allowing the action to feel more authentic with the wood in the keys to vibrate a bit from the sound waves when the "digital strings" are vibrating, as a key would normally do in a real acoustic piano. 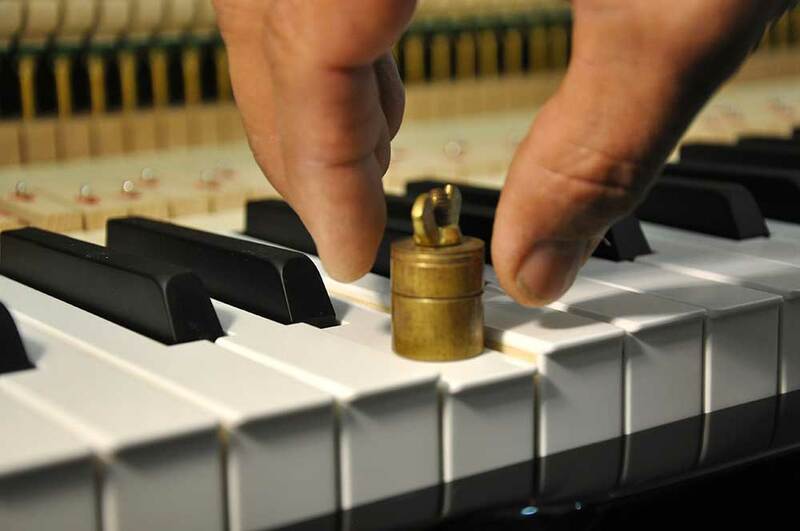 In other words, the key is not all plastic and not all wood as you would normally find in the other popular digital piano brands and Roland would claim this is the best way to produce a key in a digital piano. I personally don't know if it's the best way to make a key and I doubt that the small amount of wood in the key does too much other than look nice, but as long as the keys move smoothly, are balanced well, and are graded weighted in a satisfying way, then that's what I look for, and I believe this new key action called the PHA50 does all that for most people. It is an upgrade to the previous key actions called the "Premium Action" which Roland had in their previous DP90e. Although I always felt that the Premium Key Action was very good and enjoyable to play, this new PHA50 action is even more so and I did notice some upgraded advantages. It is definitely worth mentioning that the new top-of-the-line PHA-50 key action is on all of the new Roland models in the higher price ranges as well as these 2 models here. This is not the case with Kawai and Yamaha digital pianos where they reserve their best upgraded key actions for their more expensive models. So price alone in a digital piano does not necessarily determine quality or realism when compared to a real acoustic piano. 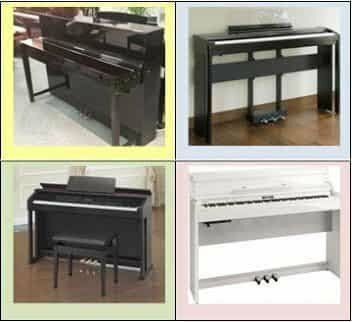 Acoustic piano key actions vary from one piano to another, one brand to another, and there are differences between grand piano key actions and upright piano key actions. 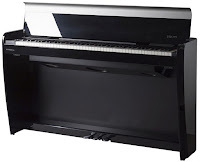 So when it comes to digital pianos key actions, the new PHA50 composite action (plastic + wood) in the DP603 is without question an upgrade to what was previously available in this price range before with regard to Roland digital pianos. This allows Roland to be more competitive with the other brands in this price range although the other major brands still have very good key actions. But as far as Roland goes, it does not matter which new furniture cabinet model you get at this point starting with the DP603 and going up from there...they all have the identical key action as well as the same digital features. This newer Roland key action also has the "escapement feature" which simulates the movement of grand piano keys when you press them down slowly and easily and you feel them slightly hesitate or have a notch or bump that occurs as you press the key down. This type of feeling is a natural occurrence on a real grand piano but you cannot feel it on most upright pianos. It can help with key control when playing music legato and slowly. Kawai also has the escapement feature which they call "let-off" and that key action is in the newer Kawai ES8 and all of their other digital pianos in this price range. Yamaha does offer the escapement key action feature but only in their full size cabinet pianos starting at around $2000US. But just because the feature (escapement/letoff) may be there doesn't mean it's working well or is necessarily authentic, because at the end of the day these things are just simulations and if you played a real grand piano that function would feel entirely different. So the bottom line is that it's nice to have it in these digital pianos but it's not absolutely necessary because it's only a simulation. Another thing I noticed about the new Roland key action was how much more quiet it was as compared with their previous models when the keys are moving up and down. By nature, regular acoustic piano key actions do make some noise when the keys are moving, but because those pianos are always so loud and they don't have a volume control or headphone jack like digital pianos do, you cannot hear the key action noise when playing the piano. However in a digital piano, when you have the volume somewhere between low to medium level or when you are using headphones, then you can definitely hear the key action moving and noise is more of a concern. I can say for sure that the key action noise level on these new Roland pianos is the lowest that it's been on any Roland digital piano and has surpassed the previous models for an even lower key movement noise reduction level. The previous models were already pretty good and more most people were satisfied with the fairly low ambient noise level of the moving keys. But the new PHA50 key action has definitely surpassed this and has become quieter and smoother in key movement and this is something that I think many people will appreciate, especially if you play at a higher skill level or you use headphones a lot. Gone are the days on older model Roland key actions when all you could really hear were the "thump" of the keys going down. When you combine this new Roland hybrid key with the quieter, smoother graded-weight (quick response) key movement along with good key action "down weight" & "up weight" return (measured by actual weights - left pic), you really feel like you can express yourself in a more authentic musically correct way as compared with previous models, at least that's the way that I felt about it when playing this new key action. Then you add the nice escapement feature in the key action that I talked about along with Roland proprietary synthetic ivory & ebony feel keys (they do feel good), and the Roland company has really stepped up to the plate by improving upon what they already had in the previous models. This key action is not a major breakthrough in my opinion compared to previous models, but I believe that beginners through advanced players will appreciate it very much. 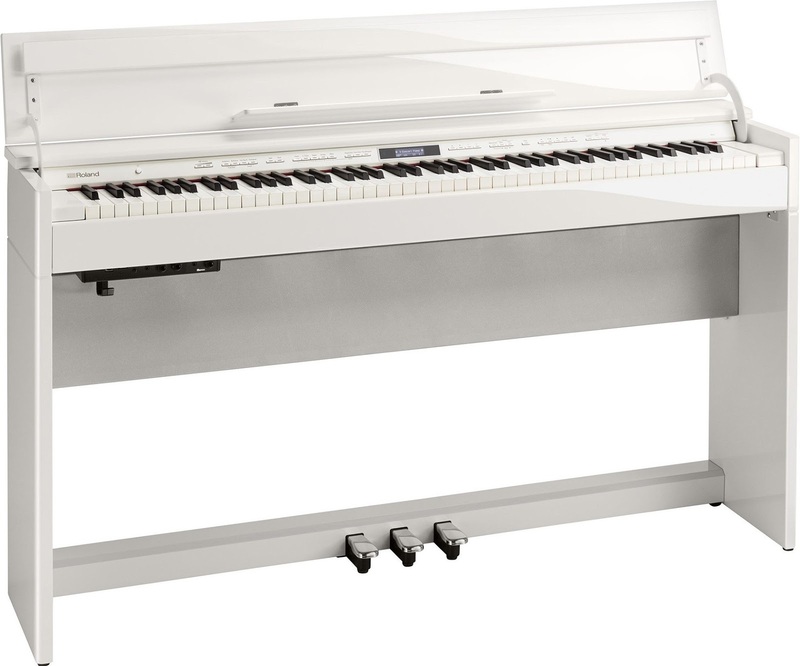 The new PHA50 key action is available in all of the new Roland piano models rather than just in selected higher priced models such as what other brands offer. When it comes to piano sound and getting as close to approximating or matching a real acoustic piano, there is no digital piano that can exactly reproduce a real acoustic grand piano sound regardless of what anyone else may say. It simply has never been done and no digital piano brand can rightly claim that they have done it. So the next best thing is "how close can a digital piano get to a real acoustic piano sound playing experience?" If you knew how complex a real acoustic piano sound actually is and what is actually happening in a good grand piano when it comes to the piano sound itself (what it does and how you hear it), you would probably think it would be impossible to recreate it digitally because there are certain piano sound elements that happen in "real time" that are always changing depending on how fast or slow you play the keys, how hard or soft you hit (play) the keys, the type of wood the piano is made of, how much soundboard space you have in the real piano, the types of hammers and key felt that is part of the key action, the vibrations and overtones of the 230 strings (give or take) in a real grand piano and how they all interact with each other including the random vibrations, sympathetic noises, frequency changes, tonal dynamics, string thickness, string windings and materials, the scale design, the piano iron frame, dampers and their affect on the sound, decay and sustain time of the sustained strings, volume, duration of the tone and changes in velocity, among other things. Even the the style of music you play such as chording, voicing of chords, staccato and legato of the notes, and the interaction of the string vibrations on the body of the piano all contribute to the final outcome of the sound. 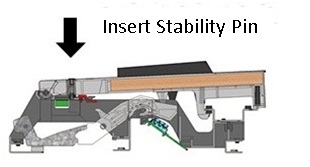 Not only are the key action elements quite complex in a real acoustic piano, but in a lot of ways the piano sound is even more complex and trying to get that "perfect" reproduction which people are looking for in a digital piano is very difficult given the current technology that most digital piano companies are using. I am a long time piano teacher and pro musician of 40 plus years having taught thousands of students as well as owning, playing on, and teaching acoustic guitar. When it comes to natural grand piano sound, to me that is what it's all about...beauty, soul, feeling, the piano sound being alive and not digital sounding, and feeling like when you play a song, you can play it may times and every time it comes out a bit differently because a real piano sound is "alive & breathing" and changes, and is not canned, digital, dead, plunky, or without taste or expression. I mention all of this so that you will better understand what I am about to share with you. Up until now, Roland, Yamaha, Kawai, and Casio, the four main digital piano companies out there, have been using "sample recording" technology to capture piano sound from a real piano and then put it into the digital micro-processor chip in the digital piano so that it comes out of the speakers and sounds as much like a real piano as possible using that sampling technology. 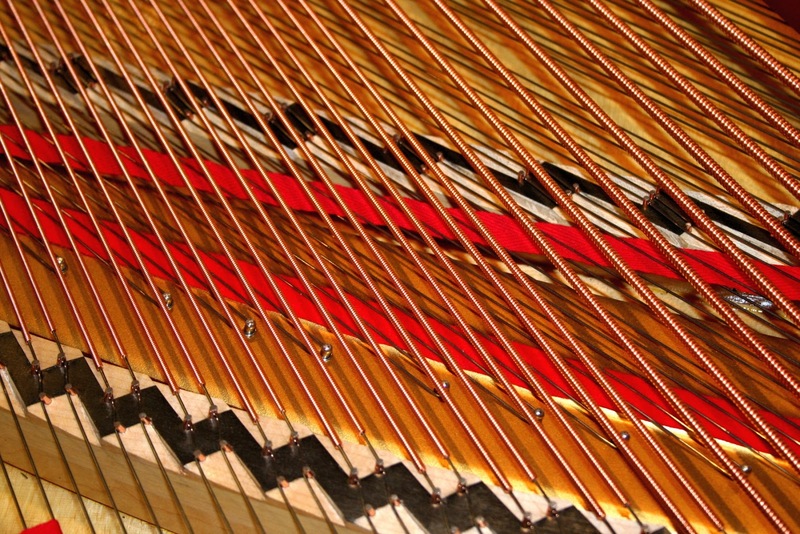 The "samples" or recordings are of each piano note (not each string) on a particular brand and model of acoustic grand piano at different velocity levels when pressing the keys and those recordings, which are done by microphones inside and over the acoustic piano, are relatively short samples of the sound due to digital memory constraints. This is true for all major brand digital pianos. 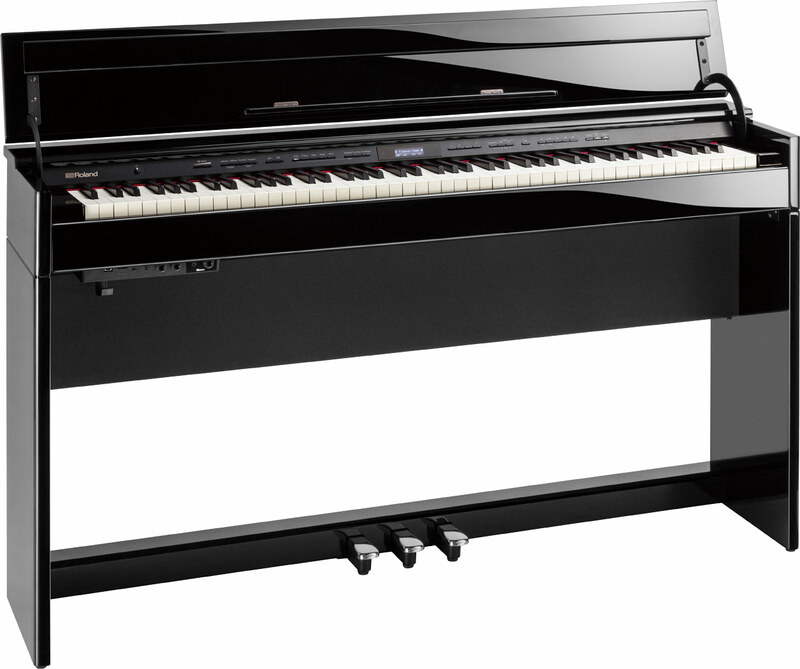 Yamaha uses Yamaha acoustic grands, Kawai uses Kawai acoustic grands, and so on. The sample is then electronically "looped" into a continuous virtual circle/loop so that it will sound like it is continuous in real time linear playback. But when you play a real piano, the piano sound starts when you first touch the key and hear the sound and then it stops when you let go of the key and pedal. 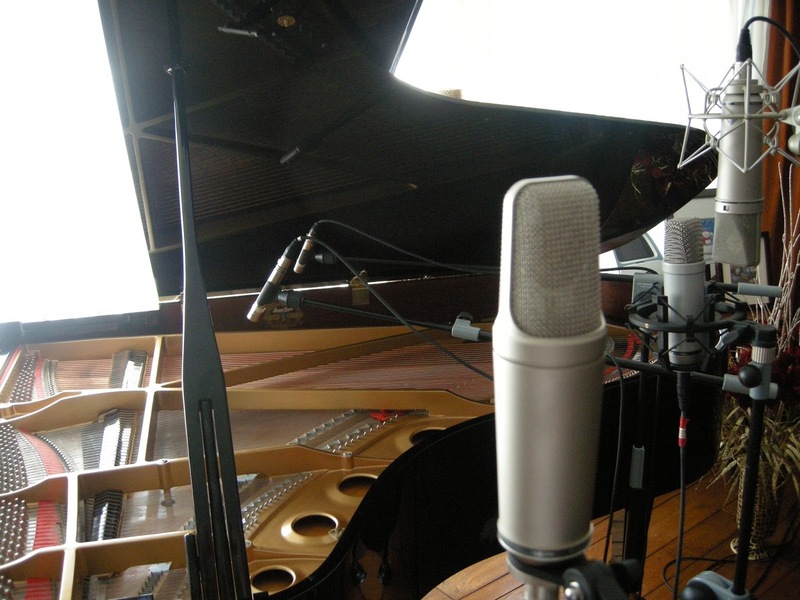 That acoustic piano sound is one straight continuous ever-changing sound in real time. Sampled recording is actually taking a slice or piece of that original piano sound and then is looped in a virtual circle, as I just mentioned, so it plays over & over. 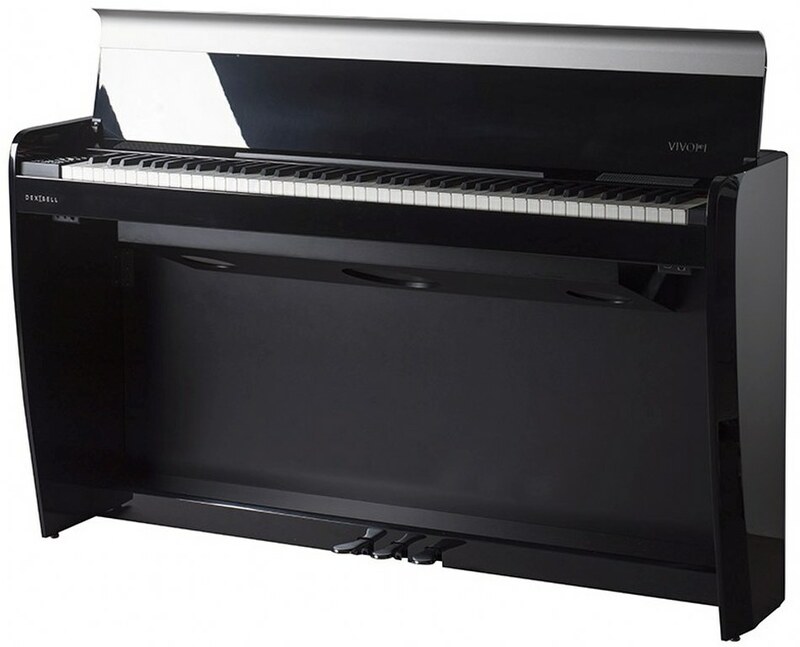 Some of the better sampled digital home pianos such as the Dexibell H7 use very long samples plus physical modeling technology giving a very natural piano sound. Korg piano company also uses sampling technology and their samples are very long and well defined, especially in their new G1 Air digital home piano ($1399 internet discount price) so they do sound natural.However on other cheaper brands and models, depending on how and where the loop is electronically fastened together, you may hear a noticeable anomaly (depending on how the loop was put together) when the loop starts over. In other words, the sound will end and then quickly start over while you are holding the piano key down. It just depends on your ears and how sensitive they are to a real piano sound and how good the sampling process is on the brand & model. However, Roland has now gone beyond the standard industry piano sound sampling technology by introducing a newer sound technology for the DP603 called SuperNATURAL piano Physical Modeling. Modeling (aka: modelling) is different from sampling in the way the sound is created and the way you hear it when the piano is being played. Along with this technology being implemented to create an all new piano sound, Roland is putting it in all of their new models instead of just a few at the top of the price range. This means that you can get this new technology of piano sound reproduction starting at around $3000 in their cabinet models. It is typical for digital piano companies to reserve their best features for the most expensive models to get you to spend more money but Roland did not do this, and that is impressive to me and I commend them for that. So exactly what is SuperNATURAL Modeling technology and what makes it different then all other digital pianos? 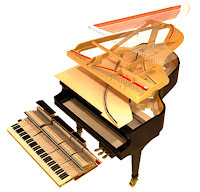 In Sampling technology, the sound elements in a real piano need to be recorded with microphones, as I previously mentioned, and then those recordings need to be translated into computers and then saved in the digital piano sound chips on circuit boards. 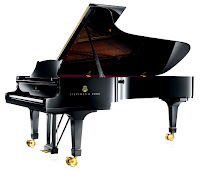 The recordings can be of a number of different things in a piano including the sound reproduction as you strike a key at different velocities and the noise the hammer makes when it moves, just to name a few. 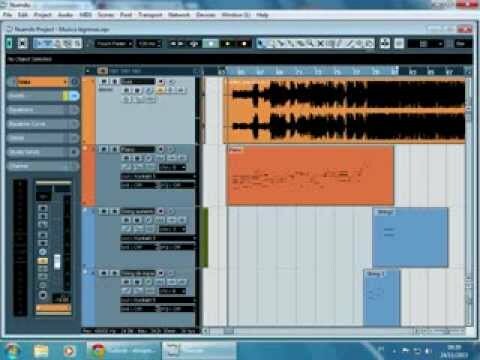 Sampled sounds take a larger amount of computer memory to do it correctly (or as close as can be done), and that may or may not drive up the cost of those instruments. Physical Modeling sound is not recorded from an acoustic piano but is created through non sampling computer mathematical algorithms. I am definitely not a mathematician so the best explanation I found on the subject which I believe is important to understand (at some level) so that you can appreciate this new piano sound technology, is as follows: "In sound synthesis, physical modeling synthesis refers to methods in which the waveform of the sound to be generated is computed by using a mathematical model or formula, being a set of equations and algorithms to simulate a physical source of sound, usually a musical instrument. Such a model consists of laws of physics that govern the sound production, and will typically have several parameters, some of which are constants that describe the physical materials and dimensions of the instrument, while others are time-dependent functions that describe the player's interaction with it, such as plucking a string, or covering toneholes. For example, to model the sound of a drum, there would be a formula for how striking the drumhead injects energy into a two dimensional membrane. Thereafter the properties of the membrane (mass density, stiffness, etc. ), its coupling with the resonance of the cylindrical body of the drum, and the conditions at its boundaries (a rigid termination to the drum's body) would describe its movement over time and thus its generation of sound." That's the explanation I found that best explains this technology although if you don't understand it...don't worry, a lot of other people don't either:). In piano sound physical modeling, that technology is dealing with things such as the energy/force you put into the playing the keys, the interaction of the tonal dynamics, piano hammers, felt movement on the hammers, string movement over time, overtones that excite other moving and non-moving parts of the strings and wood cabinet, and many more physical aspects of a real acoustic piano.,..and all of these physical properties in a real piano are recreated by computer computations. It's like a powerful computer that draws a "virtual picture" of every aspect of the best acoustic grand piano possible and then that "virtual picture" instantly comes to life as that actual acoustic piano played instantly in micro seconds with no repetition or sameness. This technology is supposed to give you the feeling that the piano sound which you're hearing is being generated from an real acoustic piano, when in fact is is all done in the virtual technology world. But does this new technology actually do what it claims to do? Roland has tried to emulate the Steinway Concert grand piano sound over the years and that's what they have tried to do here with these new digital pianos much the same way as the real thing does. Having this kind of modeling technology gives the player an approximation of Steinway grand sound characteristics without the large size and expense of that acoustic piano. An example of the new Roland sound is when you press any one key on the Roland piano without having any additional reverb or sound effects on, that one note will also trigger natural occurring "overtones" for that specific note that you would normally and naturally hear in a real piano. Also, just when a person thought that 256-note polyphony processing power for the piano sound was a lot, the new Roland physical modelling technology has jumped that polyphony number up to...infinity and beyond:)...in other words...unlimited polyphony. There is no limit because of the way the sound is generated in the virtual physical world. However, the 256-note polyphony (and even less polyphony) in other name brand pianos is way more than enough to power even some of the most complex piano music that a person can play. The unlimited polyphony on the Roland pianos is for the acoustic piano sounds only but not for the non-acoustic piano instruments such as electric pianos, strings, organs, choirs, brass, etc. Those sounds offer 384-note polyphony which is also more than the other brands do, but once again, not something that you'll actually notice when playing these instrumental sounds. Also, polyphony power has nothing to do with the actual instrument sound samples and the authenticity of those tones. However, when you combine that polyphony power along with a 3-sensor key action, the musical expression and dynamic tonal & volume range you get in these new pianos is impressive. From very soft pianissimo to extra loud forte volume. these new pianos go beyond what a person might otherwise expect out of a digital piano, particularly a Roland digital piano. So when it comes to looking for unfiltered, unadulterated, natural piano sound and expression which is ultimately what everyone wants who is shopping for a good digital piano, at this point in my opinion, Roland's Physical Modeling technology is trying to get to that point. However, it's still far from"perfect" and some people might be happier with the sampled piano sound (or combination of sampled sound plus physical modeling) depending on what their "ears" tell them. This is because, after-all, a digital piano is obviously not an acoustic piano no matter what the digital sound technology is like. Whether or not YOU can distinguish the difference between a traditional sampled piano sound and the way it behaves when playing a song, and that same song played on a piano with Physical Modelling technology such as what is in these new Roland pianos, that is what really counts. For me and my ears and based on years of playing hundreds of real acoustic grand pianos, overall the piano "physical modeling technology" sounds somewhat digital and less natural (organic) to me than the current sampled piano technology models such as what is offered by Kawai, Yamaha, etc. However, some people may have a more difficult time in determining (on their own) those differences primarily because most people don't know what a real piano actually sounds like, or if they do, they don't play well enough for those differences to really matter. But at the end of the day the new DP603 will do a nice job when it comes to acoustic piano sound realism in a digital piano furniture cabinet...although as I said, it's certainly not perfect and there are a couple of noticeable piano sound and pedaling anomalies (at least they are noticeable to me) which I do not hear when playing on real acoustic pianos and may possibly bother some discerning piano people. The Physical Modeling technology still has a long way to go but perhaps someday Roland will perfect it...we'll have to wait and see. I did want to mention something about pedaling and the fact that without proper pedaling response and reproduction, the pedal movement, sound, & sustain that occurs from pedaling, especially with the right damper pedal, would not be nearly as enjoyable and could even create some poor pedaling habits. The right damper pedal is critical for allowing the music that you play on a piano sound good. The right pedal produces the sustain which holds the notes for a duration of time after you play the key(s) while the right pedal is held down. Physically it's a fairly simple process overall pushing down the pedal and playing the notes, but in reality the process is much more complex as far as what you will actually hear and experience when doing that. In the world of digital pianos one of the most noticeable things that occurs with the right damper/sustain when holding it down (while playing notes) is the lack of sustain/decay time, especially on the middle octaves up through the last octave. In other words, the decay time of the notes die off more quickly than they should when the sustain pedal is held down. Therefore the song is more choppy and the transitions between notes and chords are not nearly as realistic as they should be. 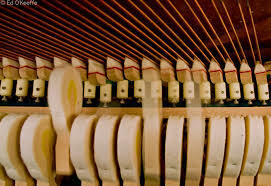 In a real acoustic piano when you press the right damper pedal down, you will not only get long sustain time but also the sustained volume will stay louder and stronger over time as well as the interaction of the sustained strings sound more complex with noticeable overtones, harmonics, and a variety of vibrations all happening in real time. The new Roland DP603 does an excellent job of trying to recreate a real pedaling and piano note sustain experience using this new physical modeling technology. However, occasionally when playing certain chords or notes together in various octaves, especially in the middle octaves, I did notice too much mid range sustained tones (especially when I was using the damper pedal) that were unlike a real piano. This gave me the impression that the sustained piano tone (while using the damper pedal) was somewhat overdone and not natural like a real piano is. I tried to compensate for this by editing the piano sound in different ways with sound editing functions as well as reducing sustain/decay time with less pedaling, and that did help a little, but did not eliminate it altogether and it was still noticeable to me. As with all new technologies, physical modelling is not perfect yet and Roland will no doubt get it to become better over the years to come, but for now it's still very impressive. 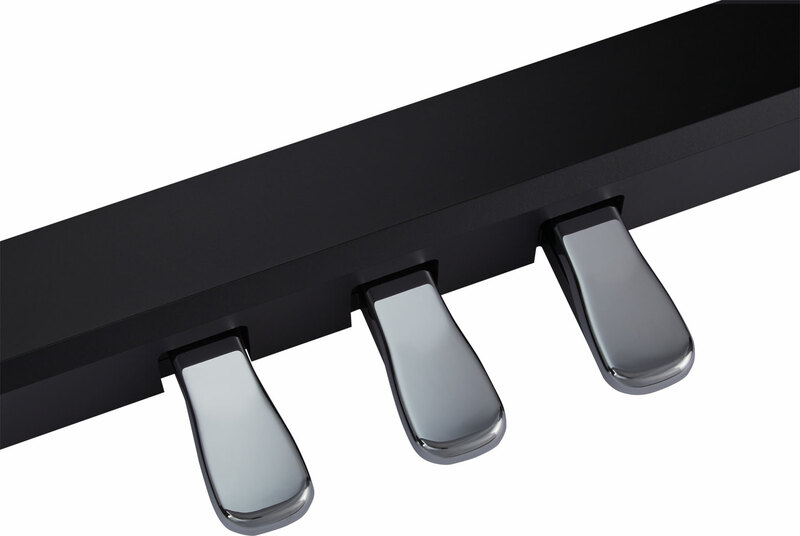 Roland also uses continuous pedal recognition which follows your incremental pedal movements instead of having just the standard half-pedal recognition found in other brands. Nevertheless, it was very nice for me to experience all these features in these new Roland pianos and until you get to a more advanced piano playing skill level where you can really appreciate these features, it may not matter to you...but I guarantee it does make the music become more alive and sound more authentic. The middle and left pedals do function well and will stand up to more advanced players. But because those pedals are not played near as much as the right pedal, then the right pedal is the one most people will be familiar with and if that's what you want then overall you should be very happy with the pedaling functions and features. With regard to all of the fundamental parts of piano playing which I have just talked about including key action, piano sound, and pedaling. if all there was on this model was that you just turned on the power and started playing piano, that may be enough for some people. But for other people who enjoy "tweaking" and customizing the sound, feel, and overall piano playing response, Roland has included a huge amount of editing functions called "Piano Designer" just for that very purpose. In fact many of these functions are quite useful and allow people the opportunity of personalizing the playability along with the piano sound to their particular tastes and playing experience in a number of ways. These features are fairly easy to use although they may be "over-the-top" for some people, but that's OK because it's better to have them then to not have them in my opinion. In regular acoustic pianos there are ways that a piano technician-tuner can personalize and customize the piano sound and key action but that can be an expensive process. In the Roland digital pianos this process is in the "digital domain" so it's free, right at your fingertips by the press of a couple of buttons and you use your ears, fingers, and foot to determine what you like and don't like. Once you make a change to the overall piano sound you can then save it to a power-up memory. However the piano also has an instant memory feature which saves your changes as you go without needing to do anything extra...a very cool feature that I have not seen before in pianos like these. If you don't want those saved changes anymore you can then just reset the piano easily to the factory default settings. 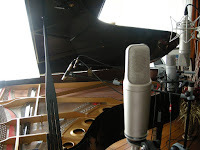 Some of the sound editing changes that you can do include Grand Piano Lid height position, Key Off Noise, Hammer Noise, Duplex Scale adjustment, Full Scale String Resonance, Damper Resonance, Key Off Resonance, Cabinet Resonance, Soundboard Type, Damper Noise, Single Note Tuning, Single Note Volume, Single Note Character, 100 levels of key touch velocity (the way the keys respond to your touch) along with multiple levels of Ambience/Reverb and Brilliance customization. All of the functions and buttons are accessed along the top the keys on the control panel. In my opinion this is the most intuitive and usable placement of controls, display screen, and button placement on a digital piano although Kawai has the same control panel placement and that's a good thing. 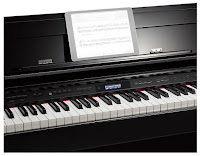 So when it comes to just playing the piano, you can do it the old traditional way and simply power up the Roland piano and play, or you can edit and personalize the sound in just about any way you want to and see what you're doing in the nice LCD display screen in the center of the piano above the keyboard. Ok...so now it's on to some of the useful digital features and non-piano sounds and functions these new pianos have. 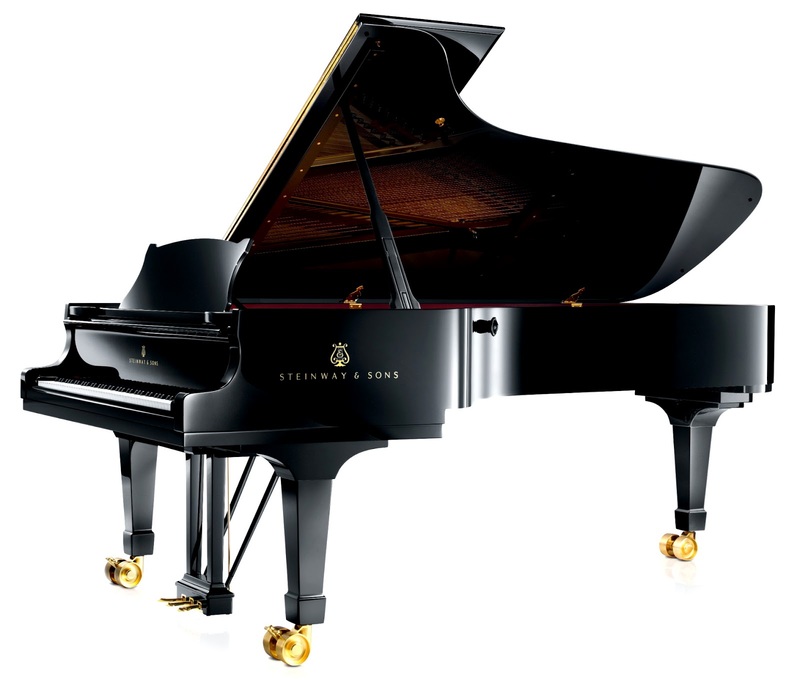 The new Roland pianos have 4 Physical Modeled grand piano sounds including Concert, Ballad, Mellow, and Bright with the ability to edit them in 100's of ways as I mentioned earlier. It is not the quantity of individual piano sounds that count but it is the quality. 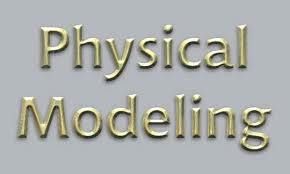 Beyond those physical modeled sounds are the addition of 8 more piano types including upright, ragtime, and Forte pianos. 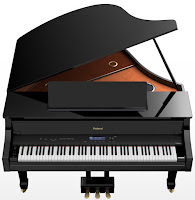 There are a total of 307 instrument sounds on the new Roland cabinet pianos including some outstanding symphony string orchestras, vintage harpsichords, vintage electric pianos, pipe and pop organs, church and pop choirs, concert harp, classical guitar, oboe, concert flute, jazz saxophone, bluegrass banjo, synthesizer, movie sound effects, and just about anything else you can think of. However, the new Roland pianos have an annoying issue with regard to changing instrument sounds when you are playing live in real time (including the piano sounds) that they did not have on previous models, and this is called "all notes off" function. This means when you change from one sound to the next such as piano to harpsichord, concert piano to mellow piano, electric piano to strings, guitar to flute, etc, if you are holding down or playing one or more keys (and/or holding down your sustain pedal) to continue to hear the current sound you have and then changing sounds in the control panel to go to the next sound you want, the current sound immediately cuts off and stops playing until you re-key and start playing again. This is especially annoying when playing in a live setting, event, etc, and wanting to change sounds in the middle of a song. The sound to sound transition is not smooth, but instead it's choppy and just irritating. It's interesting to note that on previous Roland models they did not have this problem and changing sounds was smooth, flowing, and worked fine as it does on the other major brands and models. However perhaps this issue is due to the new Physical Modeling technology and Roland has not figured out a way to overcome this noticeable anomaly. I personally play in a lot of "live situations" and count on being able to change sounds quickly and smoothly during a performance with any "hiccups." But on these new Roland pianos this is not possible unless Roland can come up with an update to solve this problem. A lot of people say to me "I don't want or need a lot of extra instrument sounds, so if the piano just has some great piano tones, key action, and pedaling, then that's my main focus." As a piano teacher and pro musician I totally understand and agree with that, to a point, but there are some good reasons to have all of those extra instrument sounds on the piano such as being able to make a multitrack, multi-instrument recording or using what is called "General MIDI" song playback. All Roland piano models can play back General MIDI song files from a USB flashdrive which is a great feature and one I use quite often in my studio for song learning and teaching. The General MIDI/GS song format allows you to play your piano parts live along "with the band or orchestra" in prerecorded MIDI songs and to interact with multiple instruments (up to 16 tracks) at one time using well known piano lesson books including thousands of popular songs off the internet from a variety of music styles and eras such as Jazz, Latin, Country, Rock, Gospel, Christian, movie themes, classical orchestra, pop, and much more which can be found on the Internet. Some of this music is free and some costs money. For more info on the General MIDI format go here: General MIDI and Playing Piano. The MIDI song titles (and page numbers depending on the files) can be accessed and seen from the LCD user display screen on the piano which makes using it easier to know what song your flashdrive is playing as compared to only having LED display screens or none at all. 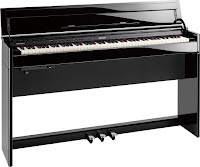 With Yamaha Clavinova CLP digital pianos for example, the only model that has the General MIDI song format is the top of the line CLP585 which is priced at $5000 and up. With Kawai digital pianos the only cabinet model with General MIDI playback format is priced at about $2500US which is good. However, all of the new Roland cabinet pianos have this helpful and entertaining songplay and lesson learning format starting with this DP603, so their models cover all the price ranges and cabinet styles. I will say that using the MIDI song playback feature is definitely not intuitive in this piano or any of the other Roland models above this one. There is no clear instruction in the owners manual on how to do it correctly and trying to figure it out on your own can be frustrating. It even took me awhile to get the hang of it (and I have lots of experience with these things) so Roland could have done a much better job with implementing a USB flashdrive "plug & play" feature instead of what they have now when accessing MIDI folders off a USB flashdrive. It's very disappointing when wanting to get to things quickly and efficiently. 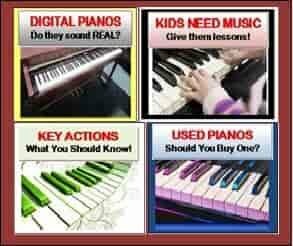 Roland has a number of other ways its pianos can record music and play back songs for music education & learning that are quite useful and can be important when trying to learn music whether you are a beginner or professional. 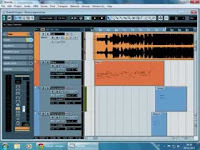 This special recording and play back can be done as a 1-track audio WAV file which allows you to have an actual CD quality song that can be played on other devices such as your computer or converted to a MP3 audio file to play on an iPad, iPod, or iPhone. The pianos can also record 3-track MIDI so you can have separate right-hand, left-hand, and accompaniment tracks recorded individually and then played back as one song...it's simple and fun to do. Typically most people only need or use 3 tracks of recording because you may want to hear your left hand piano part, your right hand piano part, and an orchestral accompaniment part. Some digital piano brands (like Yamaha) offer more than 3 tracks of recording in their models and up to 16-tracks of non General MIDI recording....which is nice to have but I find the extra recording tracks are seldom used by most people. The General MIDI 16-track playback format is more important for music enjoyment and learning in my opinion because most MIDI music on the internet has been recorded using this format. Roland has been building professional recording & music learning devices for musicians, teachers, and students for years who use them in their home or studio (as I do) for more effective practice sessions. If you want to know more about this you are welcome to contact me. All of the new Roland pianos offer the standard functions of layering two sounds together, splitting two sounds with one on the right hand and the other sound on the left hand, being able to play in a duet "twin piano" mode where two people can play at the same time by having 44-notes each playing the same octaves, and being able to transpose your live and/or recorded music to any key with a dedicated transpose button. The duet mode is good for teacher-student practice or for two family members practicing the same song at the same time...and you can do this all in privacy using headphones. One of the brand new features on the Roland pianos that Roland has never had on previous models is called registration memories and there is a control panel direct access button to access this function. In the past if you made some editing changes on the piano or set up some layers and split sounds, or wanted to change sounds within a song as you play it, you could not save them in memory for later recall. Saving them in "digital memory" would be especially useful for people who play in real time for events, for church, etc where you would likely be playing a variety of song sand want to set up each song a bit differently for sounds and features. rather than having to do these different setups "live" each time you played that song. The new registration memories allow you to pre-set these "registrations" or memories with the exact instrument sounds and functions you want to have and save them for later instant recall. This is a very useful feature and I certainly would be using it because I like to make changes to the sounds and functions (such as reverb amount, key touch, or instrument sounds) when I play different songs or even within the same song. With the new registration memories, of which there are 25 of them, this is now possible and I am very happy to see this new feature. You can even offload those setups to a USB flashdrive and store them in the flashdrive or on your computer if you feel these setups are important so they don't get lost. This process would also allow to save more than 25 setup memories because you can offload as many as you want to. It is important to note that the registration memories do not save all features and functions on the piano, but they do save the primary features that most people would care about. A lot of people use headphones when they are playing a digital piano for private practice so that other people in the room/house are not disturbed. This is obviously something you cannot do with a standard acoustic piano and therefore is a very big reason why people buy digital pianos...to play in privacy. Let's face it, when someone in the house wants to practice their lesson or just wants to play for pleasure and there are other people in the home who are talking or watching TV, etc, it can cause a conflict. So using headphones for piano playing allows for more time playing the piano and if that can happen then I am all for it! On the new Roland pianos there is a special "3D effect" built into the piano headphone circuitry that will go through stereo headphones which can make using headphones even more enjoyable. 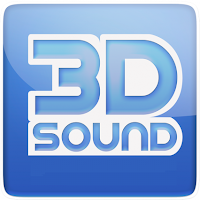 The 3D effect is supposed to give you the feeling the piano sound is all around you coming from different directions. Roland calls it "an immersive sound experience" which makes it seem like you're not actually wearing headphones at all...and that's really the point of this feature. I tried it out and found that overall, it had a natural effect and I believe most people will enjoy it. It actually did sound like I wasn't wearing headphones...although I was:). This is fairly new technology in digital pianos and it's a nice feature to have especially if you'll be using headphones often. 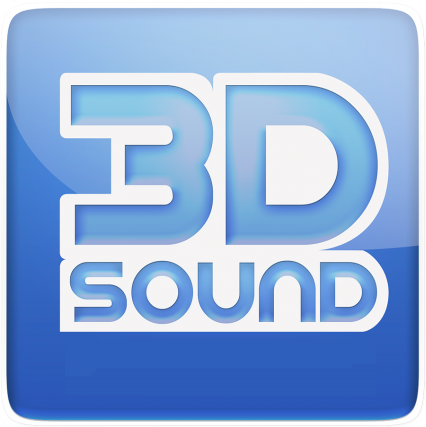 The 3D headphone sound effect only works when the ambiance button on the piano control panel is selected and it can be turned on or off or controlled in incremental levels. 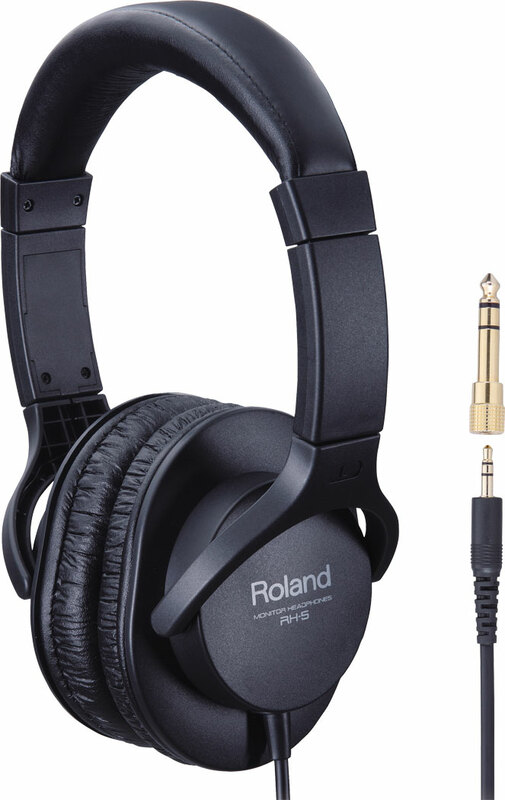 Also, it's important to have/own good sounding stereo headphones for private playing because you want to capture all the nuances of the new enhanced Roland piano sound dynamics and tonal qualities and many low priced headphones don't do that. You don't need specific headphones to have that 3D effect but I can give you some good recommendations for quality stereo headphones if you don't already have some. The speaker/audio system in each model is very impressive because Roland is using newer audio technology not previously available on their pianos before. The best way for me to explain this is by referring to light bulbs. Most people know that saving electric energy and consuming less is the best way to go. The recent changes to light bulb technology now allows for a powerful bright light bulb which uses far less energy because of the new LED technology. So basically this means that instead of using 60 watts of power (per hour) to get 60 watts of light bulb brightness, the new LED bulbs use approx 14 watts of power to get 60 watts of brightness...and those new light bulbs last much longer because they are not using as much power as before. So when it comes to sound technology, it's mostly all about wattage efficiency while offering good powerful volume (aka:decibel level) going through quality speakers and amplifiers that disperse the piano sound correctly and in a way that is most natural. Although having a lot of wattage power is not a bad thing in terms of achieving volume and sound fullness, that type of power method is using "old school" components at this point which are typically less efficient, more costly, and not as effective overall in some cases. It seems like many people want to go "green" these days so using less power and not having to replace components as often is a very good thing. The actual audio power of the DP603 is a total of 60 watts output in stereo, otherwise shown as 2 amplifiers at 30 watts each going into two 4.75" speakers while only consuming 9 watts of power (per hour). 60 watts of total power is a lot of internal power in this price range, but I have heard this audio system before and it's a bit weak in putting out a good bass response overall, but that's true of other portable or compact pianos like this one. The Roland HP603 home cabinet model has the exact same audio and speaker specification as the DP603 so there is no difference in that way. Another new technology now being put into these new Roland pianos is Bluetooth device connectivity. 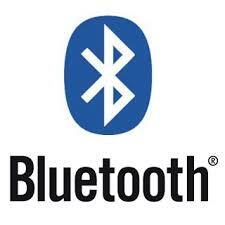 Bluetooth in digital pianos is relatively new and encompasses a number of separate features. So when you hear the word "Bluetooth" in digital pianos, it doesn't mean they all do the same thing or can do everything associated with the Bluetooth technology. 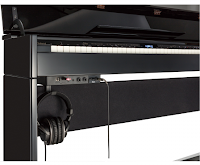 The Roland Bluetooth abilities include BT audio streaming so that you can hear the music from your Bluetooth capable external device (tablet, cell phone, computer, etc) such as iTunes come through the piano speaker system. Another Bluetooth feature is MIDI streaming connectivity so that you can interact with Bluetooth capable apps or programs such as Garage Band for iPad which is a great MIDI music and recording app. 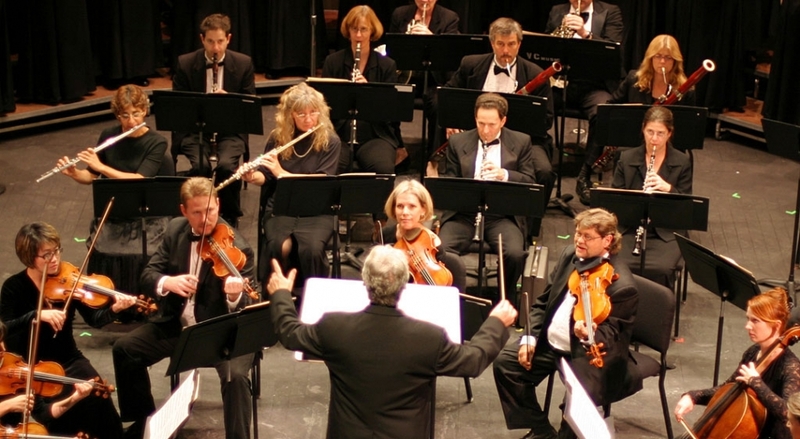 It is very popular for music education and lots of fun to use. So not only will the app respond to your Bluetooth input from the piano as you play the keys, but you can also hear the music audio coming from that app through the piano speakers. A third Bluetooth function is "pedal Air page tuning. This BT feature allows you to open up sheet music on your tablet with apps that have this "Air Page Turn feature so that you can download and read sheet music from your tablet and instantly turn the virtual pages by pressing a foot pedal on your piano exactly when you need to. One of those sheet music/page turning apps is called piaScore. With piaScore you can play thousands of songs from a free sheet music library through your tablet and turn the pages with Bluetooth page turner, and I previously mentioned. You can also import your own sheet music into the piaScore app so that you can have a custom library of songs that you can read directly from the app on your tablet device and be able to turn the sheet music pages with your Roland foot pedal page turner. So when it comes to Bluetooth and using that technology, there are still many apps that have not set up Bluetooth MIDI and/or Bluetooth audio or page turning yet. But as time moves along more and more of these app developers will do that to their music apps. In the meantime if you find some good iPad/Android music apps in the app store that respond to MIDI and audio but don't have Bluetooth implementation yet, you can still connect the Roland piano to your tablet with the use of a USB connecting cable along with an audio cable which will do the same thing as Bluetooth audio and MIDI with the exception that it will not be wireless. But for many people that is just fine and the fact is you'll still be properly connected with your Roland piano. Last but not least, Roland has developed a new Piano Partner 2 Bluetooth app that allows wireless BT connection so that you can access the sheet music to songs built into the DP603 as well as some educational note/sight reading digital flashcards in the app. Also, there are some interactive auto-accompaniment features generated by the app such as drum rhythm patterns and one-man band chord arrangement styles which you control by playing chords on the piano and hearing that accompaniment come through your piano as you play a melody and chords. It's fun and engaging and can make you sound better than you are:). Speaking of connectivity, the DP603 (just like the home cabinet models above it) have good connectivity to external devices with outputs and inputs including dual headphone jacks, stereo mini input audio jack to connect tablets, computers, iPod, etc to hear audio through the piano, two 1/4" audio output jacks for stereo connectivity with external sound systems, USB flashdrive input, and USB output to device. This kind of connectivity is generally sufficient to meet most needs although all the jacks themselves are located just under the left front of the pianos. This is fine for some connections but I would have much preferred to see the audio input and output jacks along with the USB output located on the back of the piano like most of the other brands do. 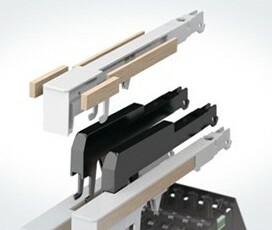 It would be the more practical position for those connector jacks in my opinion, but perhaps Roland had a reason for locating all of them up front underneath the piano...maybe it was less money for them to do it that way...but I don't like it near as much as on the back for those specific connectors. If you want to run an external device such as an iPad or computer to your piano then the audio cable needs to be routed to the front of the piano and same is true of a USB connected. Cables and connectors, especially audio output cables, should not be seen or get in the way of the player, but they do on the new Roland pianos and that should have been easy to do differently such as on past Roland models. It's definitely not a "deal breaker" for me but it is an annoyance. I do like the compact nature, size, and design of the DP603 and the cabinet color options are quite nice. But aside from the cabinet colors and finishes and the fact that the DP603 polished ebony or white comes with a nice full size matching bench, all DP603's are the same otherwise. 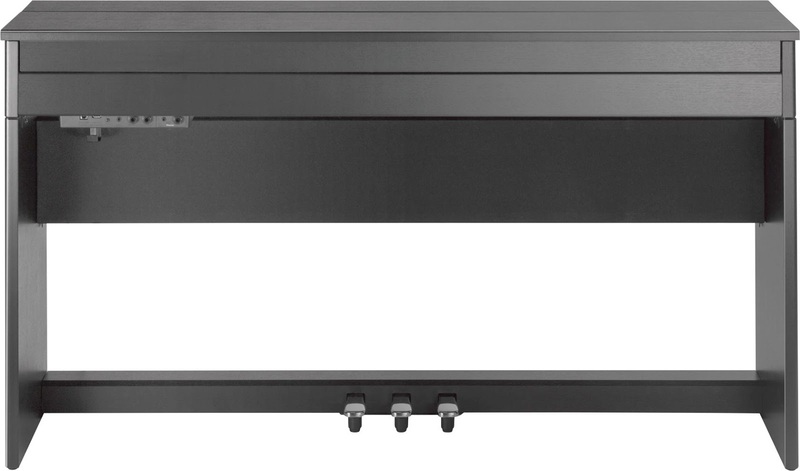 The dimensions of the DP603 are 55"x 15"x 39" high (with the lid opened). With the lid closed flat the piano is only 31" high. The weight of the DP603 is somewhere between 102 lbs and 106 lbs depending on the finish, so it's fairly light but heavy enough that you would not want to move it too often. 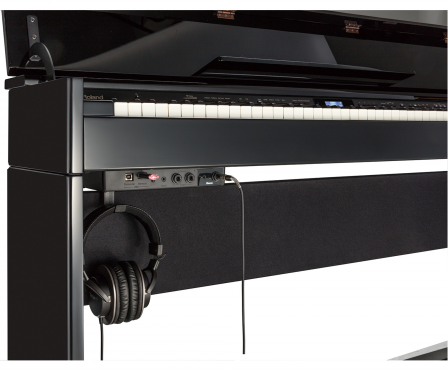 One important thing to know about the DP603 is that it is not considered a portable digital piano because the piano cannot be played without the furniture stand & pedals that come with it. So if you need something that you can take with you easily, the DP603 would not be a good choice in my opinion. 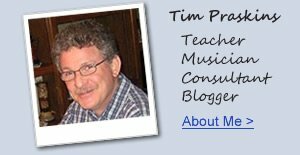 If you want more info on new digital pianos and LOWER PRICES than internet discounts, please email me at tim@azpianowholesale.com or call direct at 602-571-1864. I notice that you say the DP603 comes with "interactive auto-accompaniment features such as drum rhythm patterns and one-man band chord arrangement styles" but also that "this new Roland has no built-in drum patterns/beats, no auto-accompaniment interactive chords". Is this a contradiction? Or is there some difference in those things? Thanks. the auto-accompaniment features are generated by the Roland Piano Partner2 app, not the piano. If you have more questions or are looking to purchase one, please email me direct. actually I like both and they are different from each other just as a Kawai acoustic piano action would be different from a Yamaha or Steinway acoustic piano key action. They are just different in terms of weight, movement, and response. Great in depth review thanks! Are there manny differences between the DP603 & the DP90se? I'd love to know this as well! yes there are many differences and upgrades between the new DP603 vs the DP90Se including piano sound chip, key action, pedaling response, some digital features, as well as audio output power. However the DP90Se was a very good and enjoyable piano to play and had high quality components. Is this worth upgrading from the DP90se? How does this keyboard compare with the concert keyboard on the DP90Se? Tim. Please help me understand this better. I am trying to narrow down my next digital piano and the new models make it really confusing. The Roland DP603 replaces both the DP90e AND the DP90se ? The DP90se had the much better keyboard than the DP90e. But both the 90e & 90se were more expensive (before being discontinued) than what the new DP603 is listed for online. So does that mean that the new DP603 has the same Concert keyboard the DP90se had ? Or just the Premium keyboard the DP90e had ? Please advise. Thanks. Still deciding, but want to contact you about a price before actually ordering anything. The DP603 has the all new PHA50 action, which is an upgrade from both the DP90se and DP90e. The PHA50 is currently the highest level action that Roland offers and is the same action that is in the top of the line LX17. It also has the same sound chips as the LX17, so basically you are getting the guts of an LX17 for one third the price. You just don't have the fancy upright cabinet and high-tech speaker system of the LX17. Great review. What are the differences between DP603 and HP605? Specifically is there a future that DP603 has but HP605 missing? Yes, the DP603's feature is that it is *compact size*. 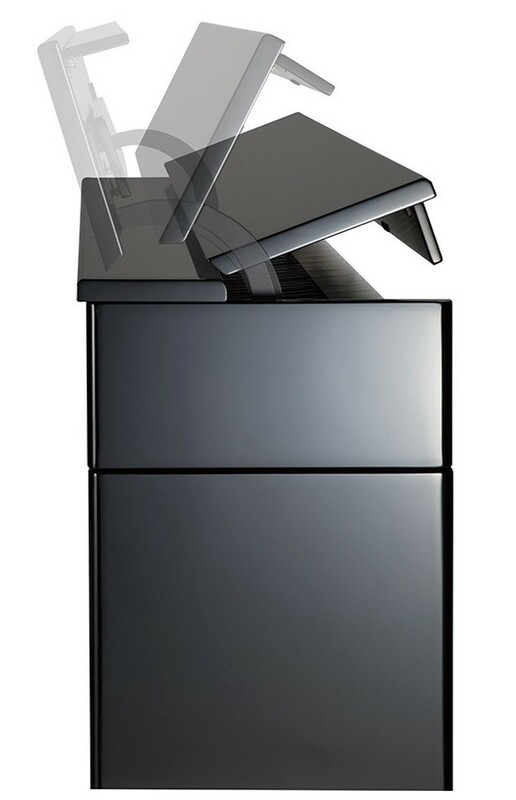 HP605 is bigger, full cabinet size and has a more powerful sound system. Check the pics and you'll see the difference. Thank you for the fantastic review. 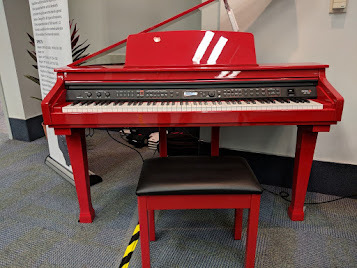 I went to a local piano dealership expecting to walk out with a Yamaha Arius 163 or a CLP 535/545 and everything changed when I played the new Roland Models (DP603/HP603/HP605). All this time, I thought Yamaha made the best digital pianos but I was very wrong. What are your thoughts on the new Roland DP603/HP603/HP605 in comparison to the Casio AP650/AP700. They are similarly priced and both brands are well known. Is there one brand that has a distinct advantage over the other to make my decision more easy or does it really come down to which one feels right to a particular individual? If I like a lighter action...which would be lighter...the Kawai ES8....or the Roland DP603? I have compared those two piano models and their key actions side by side. The Roland DP603 has more/firmer "upweight" response/pressure in the keys as compered to the Kawai ES8. This situation makes it so that you would have to press down on the Roland keys with more finger strength to compensate for the keys pushing back up with more energy. 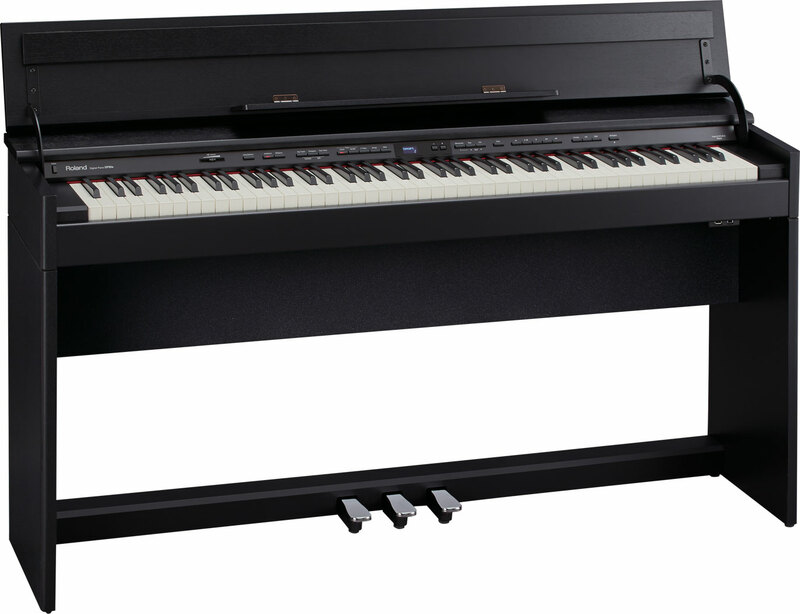 In other words, the Kawai takes a bit less strength and energy to press the keys down than on the Roland DP603 so it could be said that the Kawai ES8 has a lighter key action than the Roland DP603. I am looking to get the new Roaldn Kiyola KF-10. Could you advise on how to get at a cheaper price? Nice writeup, thanks, just ordered the 603.
does anybody know how the backside of the white roland dp603 looks like? I just bought a Roland I think HP 607 - may have been GP last week. Will postpone delivery until I do more research. Is GP any good? HP? I am an accomplished pianist but have had a p85 for 12 years so almost anything is an upgrade. The thing is, I also noticed the midrange sustain problem. When I recorded just a bit on it, the playback sounded strange, unless it was just my touch. Also when I heard a blind test yesterday online, I rather like the sound of the Yamaha CLP 635. Now the P515 might serve my needs as a songwriter, since my chief goal is to record and notate my songs with at least drums and bass where needed. Perhaps just a demo, but need to do get it started. Your thoughts on this please? I need help.